We're so proud of the SHMS Math Club and their ingenuity. Using funds from the Foundation, they purchased tools, and used their math, engineering and design skills in a competition to create sturdy cardboard-only furniture. 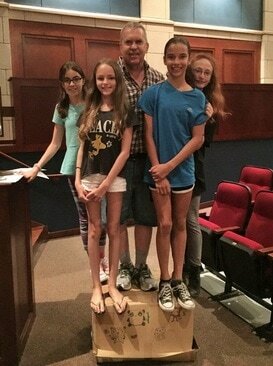 The winning team was so successful that their furniture even held up their coach, Mr. Large, and their four team members! We love inspiring our students, so the Foundation funds an annual trip to Mercy College for SHMS students. This year, 35 seventh and eight graders were able to learn about college life and get even more excited about their academic future.